I find Banggi Island to be very interesting! 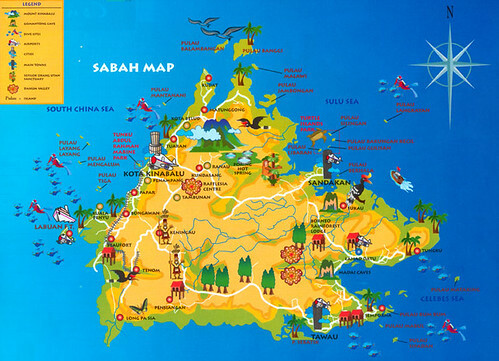 Yes, there is not much development there, and there is where you can see how Sabah “Was” before all the developments. A Great Experience i assumed! Some info if you plan to visit Banggi, there is 1 schedule ferry that departs from Kudat – Banggi island, at 1pm, it takes 1 hour, at RM18 for first class & RM15 for Economy class seat. But it is not possible to do a day trip as the ferry only depart once a day, the ferry that depart from Banggi island – Kudat leave the island at 7.15am. Yes, there is a place to stay, they call is “Bonggi Resort”. It charges RM30 for fan & RM45 for aircon room. This is also the place where you can experience staying on top of a tree. Take note, electricity is availanle from 6pm-6am only. We have been there recently, staying 2 nights. We stayed at the homestay (55 and 100 RM depending on quality of the room). This island does not have any major attractions and the harbor town is quite ugly. But still it was unforgettable trip. We got caught by philliphino guy Jimmy as we arrived in the jetty. He took us on whole day ride through the island on his Toyota (we were 6 and a kid, so some of us sat on the back). It was about 150 RM per the car, the road was rough, muddy, went through colorful villages and jungle. It felt like kinda Camel Trophy really, nice and adventurous, worth the money. He is nice to talk person. Stories about smuggling… We asked where we can get rum, he said here and stopped right there and we got a rum straight from a smuggler and drunk on back of the truck, he inside too… I highly recommend this guy if you want to see the island. He will probably approach you when you arrive. The interior of the island is beautiful, no oil palms, just bananas, coconuts and jungle. Beach is nothing special though. Next day we have organized island hopping on nearby islands with the homestay owner. It was 240 RM, I think it is a bit pricey but we shared it and wanted to see 3 islands, being left on one over night and brought back the next day. This was real highlight of the Banggi trip. After seeing 2 islands (better average) we were left on uninhabited Pulau Maliangin Kecil where we wanted to do our survivor experience. The island was beautiful, specially after we burned all the plastic bottles brought by high tide. The snorkeling was better than in Mabul, Kapalai, Sibuan etc. in Tun Sakaran (we have not been to Sipadan). We made a bonfire, tried to catch fish and shake down coconuts (unsuccessfully), hided from the storm in the sea and slept under the sky. Next day we explored the island, walked around (a bit hard and dangerous on the rocks). If you do the same, please do not leave any rubbish behind and clean even what is not yours. This is probably one of the last islands in Sabah, where you can have such experience. We were not allowed to do this on any of Tun Sakaran Islands. I have been recently- its about 1.5 hours from kudat- ferries depart 9.00am and 2.00pm I think. There is only one place to stay as far as i am aware and its basic. for a day trip you may struggle- they are not geared up for tourism- you could go to the Bonggi Resort (resort is misleading) it is a small number of very basic rooms. They could organise you a car / boat, but its pricey as you are a capitve audience. About 100RM for a boat. There is nothing really in the port when you arrive there so you would need transport,…if you are up for a bit of an adventure and potential standing around to find a taxi/ asking around – then you will find soem amazing deserted beaches! Saying that, I would prefer to go up to the Tip of Borneo instead (30 mins drive from Kudat) as there beaches are equally nice and the place is easier to get to, more built up (only slightly) – we loved it. Pulau Banggi is located in northernmost tip of Sabah. 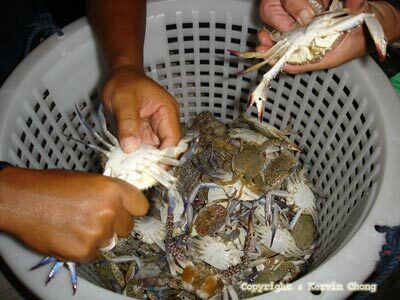 It can be reached via Kudat in mainland Sabah by boat. Photo courtesy by SM Teknik Keningau in Flickr. I have been to Sabah a few times. But I have not heard of Pulau Banggi. Not until recently I read about it in the newspaper. Upon further reading, I found out that this little island is largely unaffected by development and most of the forest there remains intact. Besides, thick rainforest forms a canopy over almost 70 percent of the island. Other than its virgin forest, the island has beautiful white sandy beaches stretches in most of the coastline on the island. Therefore, Pulau Banggi is essentially a heaven for nature lover. Since this island is largely unheard of, Pulau Banggi may not be familiar to most Malaysian. A jetty at Karakit. The only major town in Pulau Banggi. Photo courtesy by Kervinchong in Flick. But this island off the coast of Sabah is the largest island in Malaysia, surrounded by the South China Sea on the west and the Sulu Sea on the east. Situated at the northernmost tip of Sabah, the island is slightly bigger than Singapore and is home to about 20,000 people of various indigenous backgrounds. The major indigenous people of this island is called the Bonggi which numbers at around 6000. Most of people living in Banggi are fishermen and some of them are hunters hunting wild boars in the jungle as well as collecting jungle produce. With tourism flourishing on the island, some folks taking up jobs as drivers offering to ferry tourists from Karakit to remote towns with their rusty old pick-up trucks. Some of them are boats operators capable of skillfully steering boat thru the choppy water and pelting rains between Kudat in mainland Sabah and Karakit. Their main diet is tapioca, a food which looks like pudding. 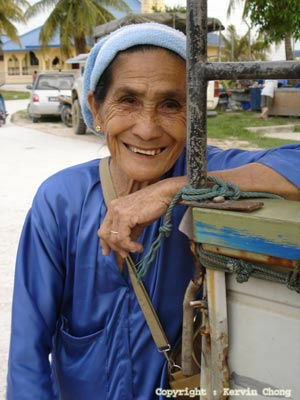 An indigenous of Pulau Banggi. Photo courtesy by Kervinchong in Flick. Banggi Island is not for the faint-hearted! Karakit is the main town on this island. There are other smaller towns but are located in the remote part of the island. Most of the towns here are undeveloped with Karakit as the main town and probably the biggest. Since this island is largely covered with trees and forests, accessibility has been a major problem especially for land transportation. There are hardly any proper tar roads on this island with most of the roads built with earth and they get muddy during rainy seasons. 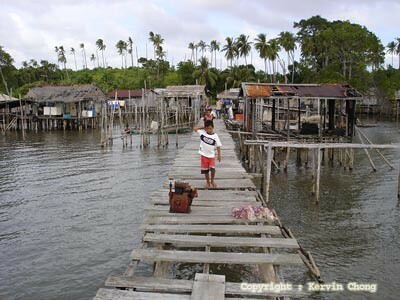 Therefore, the island’s remote villages are not easily accessible to tourists. For this reason, sea travel has been a major transportation system here with villagers using small boats to get from one village to another since most of the villages are located close to the coastlines. 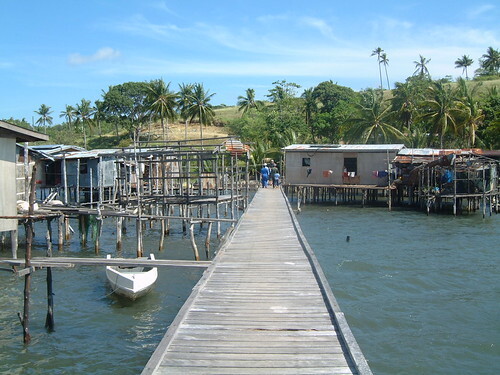 Other than its poor state of land transportation, basic necessaries such as electricity and water are hard to come by in most of the villages which makes tourists shying away from this island. A jetty and wooden waterfront houses. Photo courtesy by stefanottomanski in Flick. 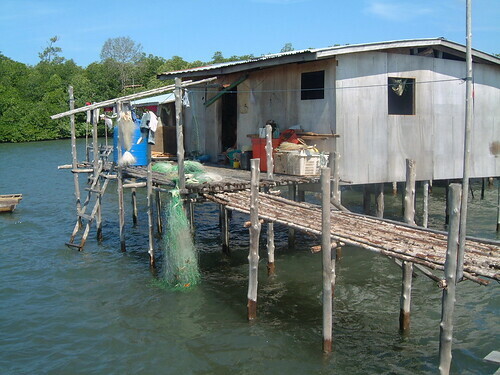 Even though Pulau Banggi is the poorest place in Sabah, its fortune will soon be reversed due to development by the Sabah state government in tourism. The government recognizes that there is vast potential in tourism industry which will bring in millions of dollars in revenue and also raise the living standard of the folks on the island. The Federal Government has been in cooperation with the state government thru a company called Felcra Bhd in the recent launch of a mega RM167 million project which is expected to bring in development to this island. In the mean time, solar power electricity is also planned in Karakit and other remote areas of the island. Some tourist attractions in Pulau Banggi include its virgin forest, crystal clear sea water, white sandy beaches, as well as a non-hectic life away from the civilization. It’s going to be a meaningful experience if you could spend a few days on this island mingling with the local folks. Some outdoor activities that you could do here are exploring the island thru land and sea, animals observation, birds seeing, jungle trekking, spending nights at tree houses, exploring the local cultures and so on. You absolutely won’t be bored by spending your holidays here despite the lack of modern facilities. In fact, what Pulau Banggi has to offer is its back-to-nature lifestyle which to some of you who come from a city, might be a totally different experience. A wooden jetty and some waterfront houses in Pulau Banggi. Photo courtesy by Kervinchong in Flick. Speaking of food, Pulau Banggi is well known for its super fresh and tasty seafood and Karakit is the place to go for seafood hunting. Usually the seafood are prepared with the freshest catch right from the trawlers that bring in the days’ catches. There are plenty of waterfront restaurants run by the locals, mainly the Bajau Laut, Suluk and Bonggi. 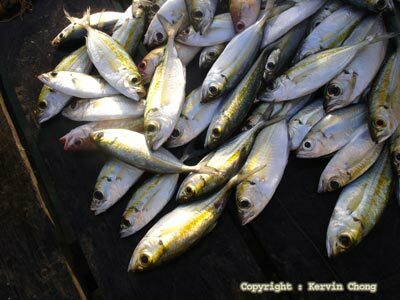 In fact, you could even have your own pick of the freshest fish right at the boats. 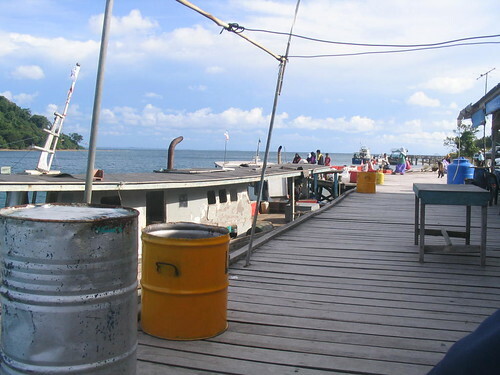 It’s not a surprise that Pulau Banggi is one of the famous exporters of fish especially to the wholesalers in Kudat. Some fresh catches of the day. Photo courtesy by Kervinchong in Flick. There is a hotel next to the waterfront in Karakit, called the Bonggi Resort. The rooms are cheap, starting from only RM60 per night. The rooms are comfortable and they come with water and electricity. For the more sophisticated one, you can even choose the air-conditioned room over the fan one or you may try the Banggi-style wooden huts. If you were more adventurous, you can even have the option of staying up on a tree by staying over at a tree house. These tree houses come with a nice sea view and gentle sea breeze. For reservation, call Bonggi Resort at Tel: 019-5878078 or 088-671 572(after 6pm). Waterfront stalls run by the locals at Karakit. Photo courtesy by HelmiAY in Flickr. 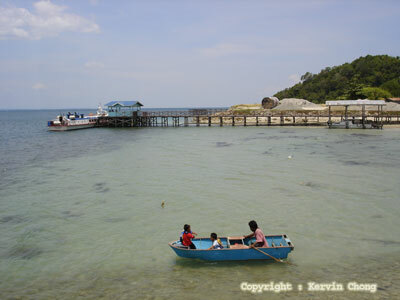 There are daily ferry service operates from Kudat, the island’s nearest mainland town, to Karakit and vice-versa. The ride takes only about an hour but sometimes it can be canceled due to stormy weather in the South China Sea and Sulu Sea. To reach Kudat, you can take a three hour drive from Kota Kinabalu or a domestic flight from Kota Kinabalu. The flight is probably offered by AirAsia, you could go to its website to check on it. I would fly there in view of the driving hours which takes about 3 hours. Sometimes bad things can happen especially when the ferry service is canceled or rescheduled to next day due to bada weather especially during rainy seasons, therefore be prepared to stay overnight in Kudat. There is one hotel there called The Upper Deck Hotel, located just next to the jetty point, offers no-frills services at a reasonable rate. For details, call Sabah Tourism Board at Tel: 088-212 121. Mountain Kinabalu – The majestic Mount Kinabalu, standing at 4,095.2m, is one of the highest peaks in Southeast Asia. It is the main attraction of Kinabalu Park, Malaysia’s first World Heritage Site. This dense jungle contains one of the world’s richest assemblages of plants. Don’t miss a visit to the Poring Hot Springs, a natural health spa offering open-air Japanese-style baths. The annual Mount Kinabalu International Climbathon draws participants from around the world. Sunday Gaya Street Market – This open-air market is the place to get handicraft, local delicacies and fresh jungle produce. The Tamu Kota Belud is another popular Sunday market for all traditional things. Watch the vibrantly dressed Bajau horsemen riding gaily decorated ponies during ceremonial occasions. They are known as ‘Cowboys of the East’ for their horsemanship. Kudat Long House – Make a visit to the traditional long house of the Rungus tribe. Their traditional attire and intriguing culture will make your trip unforgettable. Homestay are a fascinating way to observe their lifestyle. The Tip of Borneo – Experience the thrill of standing at land’s end! Simpang Mengayau Bay is the northwestern tip of Borneo. It offers glorious views of the sea and surrounding islands. Actually, Maliangin Island is a marine park protected area and soon will be under Sabah Parks management, within Tun Mustapha Park. Managed by the Maliangin Island Community Association.We are doing similar to Tun Sakaran Park where you are not allowed to do as you been doing. Get in touch with association rather then just pick any Philipino or outsider.Thank you for you patronage.